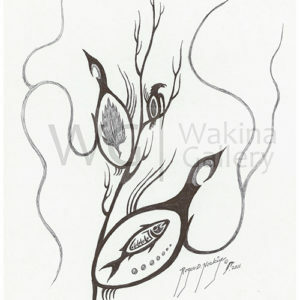 View cart “Yellow Circles Series 1 by Roger Noskiye ink 8.5″x 11″” has been added to your cart. 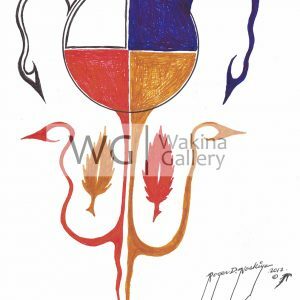 (From the Alberta Native News collection) – Roger Noskiye is a talented 54-year-old Aboriginal artist from the Whitefish Lake First Nation at Atikameg in northern Alberta. 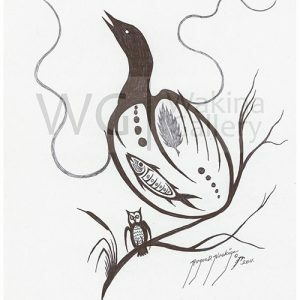 He started drawing and whittling as a child and his art was encouraged at the Northland Elementary School in Atikameg. 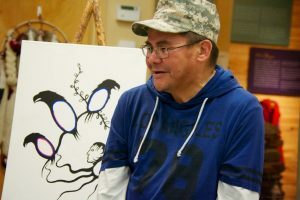 He says he ‘drew his way through middle school’ and carried on with his schooling at Grande Prairie Regional College where he finished a visual arts program. From there he transferred to New Mexico where he received a scholarship to continue his studies. He later returned to his home community and continues to work with his art and culture. The Town of McLennan commissioned Roger to paint 12 murals on town buildings and he created a mural for the Lakeland Eagles Hockey Club too. 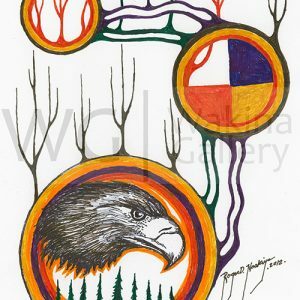 In addition to several illustrations on the inside pages, Alberta Native News featured Roger’s art on the cover in August, 2012, July, 2016 and in December, 2011 and included a story about his work and his journey as an artist. 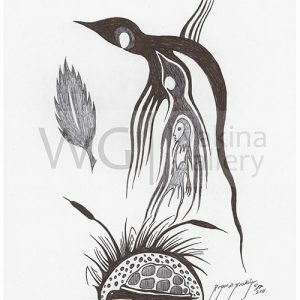 Black and White Series 2 by Roger Noskiye ink 8.5″x 11″ Unframed. 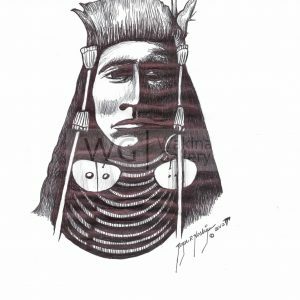 Black and White Series 3 by Roger Noskiye ink 8.5″x 11″ Unframed. 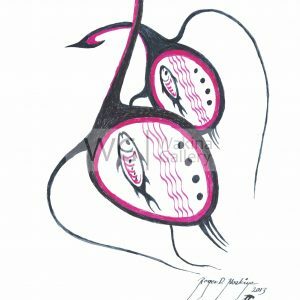 Fishing by Roger Noskiye ink 8.5″x 11″ Unframed. 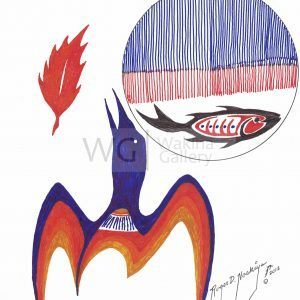 Orange Loon by Roger Noskiye ink 8.5″x 11″ Unframed. 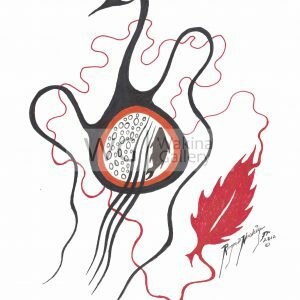 Red Loon Series 1 by Roger Noskiye ink 8.5″x 11″ Unframed. 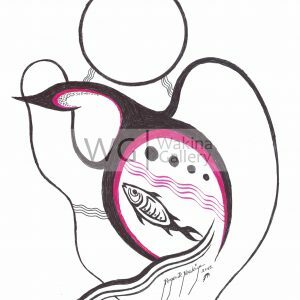 Red Loon Series 3 by Roger Noskiye ink 8.5″x 11″ Unframed. 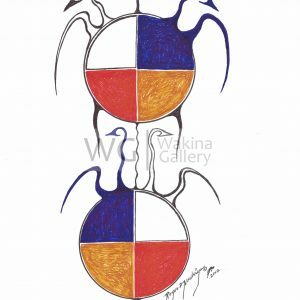 Seeing Double by Roger Noskiye ink 8.5″x 11″ Unframed. 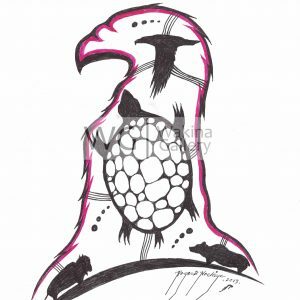 Turtle Island by Roger Noskiye ink 8.5″x 11″ Appeared on Page 22 of Alberta Native News – December 2015 Unframed. Yellow Circles Series 1 by Roger Noskiye ink 8.5″x 11″ Unframed.